In the 19th century, ample water and rich soil made Seneca Falls a town full of thriving farms and optimistic people. Idealism took hold in the many calls for progressive political reform and utopian community-building, as residents of the small New York town committed to causes like the abolition of slavery, harmony between indigenous people and settlers, and even the dismantling of church hierarchy. The deadline to register to vote in the Arizona primary election is July 30. Seneca Falls’ flowing streams also gave it the water power to build industry at a time when industry was transforming family structure. Children could be assets to farm families that needed more hands to share the labor of harvests and animal husbandry, but in industrial settings, they could be a liability, bringing costs to the home in the form of food, clothing, medical care, and education. Many women tried to avoid pregnancies by using the family planning methods of that era, which included spermicidal douches and abortion, as well as pills and tonics advertised for the “stoppage of nature” and other veiled references to contraception. As women became less involved in childbearing, their roles in the home — and society — began to change as well. Water mill, New York State. Photo: Wikipedia. People in power would not be trying so hard to keep us from voting if our votes weren’t powerful. We must not give up that power. Of 12 resolutions, it was the only one that was not passed unanimously. 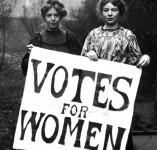 Although leaders such as Sojourner Truth, Mary McClintock, Susan B. Anthony, and Frederick Douglass supported a resolution demanding women’s right to vote, many other attendees thought such a resolution might be a bridge too far. 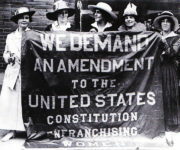 But by 1920, after women had marched, rallied, and faced abuse and arrest, several states had already adopted women’s suffrage. The Arizona general election will be held on November 4, 2014. Reproductive health care access has been under attack, both nationally and statewide, but Planned Parenthood Advocates of Arizona has endorsed candidates who have shown strong commitment to reproductive justice. To acquaint you with our endorsed candidates, we are running a series called “Meet Our Candidates.” In order to vote in the general election, you must register to vote by October 6 — and can even register online. Make your voice heard in 2014! Terry Goddard is running for Arizona secretary of state — one of eight executive positions that are open during the 2014 general election. This seat is currently held by Ken Bennett, who is barred from running for re-election under Arizona’s term-limit restrictions. As attorney general under Gov. Janet Napolitano and Gov. Jan Brewer from 2003 to 2011, state director for the U.S. Department of Housing and Urban Development from 1995 to 2002, and four-time mayor of Phoenix from 1983 to 1990, Mr. Goddard is no stranger to Arizona politics. The secretary of state is the first in line to succeed the governor in the event of removal from office, and primarily serves as Arizona’s chief election official. In a time when states are actively working to mandate strict voter registration laws to disenfranchise voters under the guise of minimizing voter fraud, it is essential that Arizona elect a secretary of state who understands Arizona from the ground up. As secretary of state, Mr. Goddard will ensure that we all retain our right to vote for individuals who will serve on our behalf and protect our basic human rights. Mr. Goddard was kind enough to talk to us on September 22, 2014. Tell us a little about your background. I am an Arizona native and ASU College of Law graduate. I am proud to have served on active duty in the U.S. Navy. I retired as a commander after 27 years in the Naval Reserve. Last year saw more state-level legislation to restrict abortion access than any other year in the last three decades, and hundreds of new abortion restriction bills have been introduced into state legislatures this year. That’s just one indicator of what’s at stake in this election year. Political assaults on women’s health care have been many, both nationally and here in Arizona. Just months ago, Arizona lawmakers voted on bills that attacked employer coverage for birth control, access to medically necessary abortions, and health care choices for AHCCCS users. With online registration and mail-in ballots, voting is easier than ever. The Arizona primary election on August 28, 2012 will give voters the opportunity to turn the tide. To help voters, Planned Parenthood Advocates of Arizona has endorsed candidates who have shown strong commitment to reproductive health and freedom. Along with those endorsements, we are running a series called “Meet Our Candidates,” spotlighting each Planned Parenthood Advocates of Arizona-endorsed candidate. To accompany the information on candidates and issues we’ve been sharing, here’s a quick guide to voting in Arizona, to help readers make sure their voices are heard in 2012! Who Is Eligible to Vote? To register to vote in Arizona, you must be a U.S. citizen and a resident of Arizona, as well as a resident of the county listed on your registration. You should also be at least 18 years old by the date of the next election. If you have had a past felony conviction you cannot vote unless you have had your civil rights restored (please see the last section). How Can I Register to Vote? You can register to vote online using EZ Voter Registration, use a printable form available online, contact your County Recorder to request a voter registration form by mail, or show up in person at your Country Recorder’s office to register to vote. Proof of citizenship is required if you are registering to vote for the first time in Arizona or have moved to a different county in Arizona. Information on what qualifies as proof of citizenship is available on the Arizona Secretary of State’s website. Any time you move to a new residence or change your name, you will need to register to vote again. If you wish to change your political party affiliation, that also requires registering again. Re-registering on EZ Voter Registration usually takes a few minutes or less, and it gives you the opportunity to opt in or out of the Permanent Early Voting List to receive early ballots (by mail) for all elections you’re eligible to vote in. If you have an Arizona driver’s license or Arizona non-operating identification issued after October 1, 1996, your number from it, your name as it appears on it, and your date of birth are the only identifying information you need to complete the process. What is the Deadline for Registering to Vote? To be able to vote in a coming election, you have to be registered 29 days prior to it. Registration for the August 28 primary closes on July 30 at midnight. Registration for the November 6 general election closes on October 9 at midnight. How Do I Find What District I’m in? Due to recent redistricting, you should check to make sure you know your legislative district. You can use the Arizona Independent Redistricting Commission’s online District Locator to find out what legislative district you live in. How Do I Find My Polling Place? You can visit the Arizona Secretary of State’s online Voter View tool to find out your polling place. Click on “Search Your Polling Place” to find out where you should go to vote. What Do I Need to Bring with Me to My Polling Place? Examples of identification without photographs include recent utility bills in your name, a vehicle registration in your name, and an Indian census card. More examples and specific information about what qualifies as identification are available on the Arizona Secretary of State’s website. What Does It Mean if I Get a Provisional Ballot? How Can I Vote by Mail (Get an Early Ballot)? To vote by mail, contact your County Recorder. What If I Need Assistance Filling Out My Ballot, Haven’t Had My Civil Rights Restored, or Am a Long-Distance Voter? If you are unable to fill out a ballot because of a disability, someone else can fill it out on your behalf and put their signature in a box to verify that it was filled out and signed on your behalf. If you are an out-of-county, domestic military voter, information is available on the Arizona Secretary of State’s website about contacting your County Recorder. Your County Recorder can provide information about submitting a ballot online, by fax, or by mail. If you are an overseas military voter, you can visit the Federal Voting Assistance Program’s website to find the toll-free number you need to call to be connected to your County Recorder. You can also use their Live Chat service for information on overseas voting. If you are a non-military, long-distance voter, you can vote by mail by contacting your County Recorder. Posted on June 5, 2012 by Malinda B.
Editor’s Note: What follows is our unedited, exclusive interview with Ron Barber, the candidate who is running to complete Gabrielle Giffords’ term in Congressional District 8. Barber has worked with Giffords since she was elected to Congress in 2006, after which he became the head of her Tucson office. He is endorsed by both Giffords and the Planned Parenthood Action Fund. Prior to his work with Giffords, he navigated bureaucratic red tape as head of the Southern Arizona branch of the state’s Division of Developmental Disabilities, advocating for vulnerable members of the community. With strong bipartisan support, and strong roots in Southern Arizona, Barber will stand for CD8 in Washington — but first, he needs your vote. The election will be held on June 12, 2012; you can also vote by early ballot. Please give me a little background on yourself: where you grew up, your education, how long you’ve lived in Tucson. I have lived here in Southern Arizona most of my life, running a small business with my wife, Nancy, and helping solve community problems — whether it was heading up Congresswoman Giffords’ district operations to help people get results by cutting through federal agency red tape, or working for 35 years to look out for people with disabilities. I was born in England, but went to high school in Tucson, where I met my wife, Nancy. We were high school sweethearts — we first started dating in 1960 and have been together ever since. I went to the University of Arizona, here in Tucson, and received a bachelor’s degree. I’ve lived in Tucson for over 50 years — my children and grandchildren all live here as well. What women’s health care issues do you see will need to be addressed in the remainder of this legislative term and in the next? Posted on May 16, 2012 by Malinda B.
It’s pretty safe to say that nearly all of the political advertisements and newspaper articles covering the Congressional District 8 race between Ron Barber and Jesse Kelly have focused on Social Security and Medicare. But, the issue of women’s health care is also critical — and one that hasn’t received much attention. Jesse Kelly is an avowed anti-choice candidate and has received support from the National Right to Life Political Action Committee. Barber, when asked about his position on choice and women’s health care, said he has always been pro-choice and believes women’s health care decisions must be made between women and their doctors. 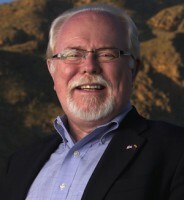 Ron Barber is running to finish Gabrielle Giffords’ term in the June 12, 2012, special election. Early voting starts on May 17.